Welcome back to another Disney Top 5. We're nearing the end of our tour around Epcot's World Showcase. It's been a long haul covering nine of the eleven nations so far. Last time we were in France. This time we're crossing the bridge and heading into one of my favorite places anywhere on Disney property, the United Kingdom pavilion. On our last three trips to Walt Disney World we have been lucky enough to stay in the Crescent Lake resort area, twice in the Yacht Club and once at the Boardwalk Resort. One of the most tremendous benefits about staying in this area is being able to walk right into World Showcase through the International Gateway. I'll be headed back to the Yacht Club this summer to celebrate my 50th and I'm eagerly awaiting returning there for a multitude of reasons; one of the biggest is being able to stroll casually to and from World Showcase with ease. We'll typically venture into Epcot first thing in the morning, before World Showcase opens for the day. The plan is to head into Future World and hit some of the attractions over there like Spaceship Earth, Nemo, or Soarin'. One of the joys of this early morning walk is entering the International Gateway, Epcot's "back door," turning left and heading through the United Kingdom pavilion before it's open. It feels like a special treat getting to see the UK and Canada before all the other guests that are arriving through Epcot's main entrance. Walking through an empty UK pavilion is a great way to start a magical day at Walt Disney World. As soon as we pass through, I immediately can't wait to come back when it eventually opens at 11 o'clock. I love spending time in the UK. Despite no attractions, there's plenty to see and do for everyone in your group. 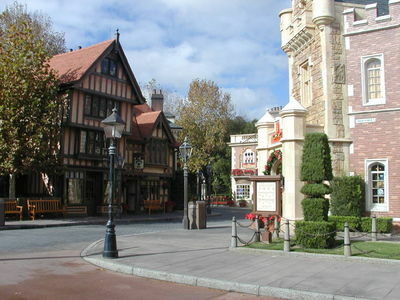 Let's see what my front-runners are with my Top 5 things to see in Epcot's United Kingdom pavilion. I've had several Advanced Dining Reservations for the Rose and Crown, and have always been faced with some conflict that arises and forces us to cancel. I can't really point to a specific reason why. Plans change once you get down there, but suffice it to say that we've never eaten there and it continues to bum me out. I'd love to score a table by the lagoon, especially around Illuminations time. If you're looking for a completely unique Epcot experience, forego the reservations and just stop into the pub for a pint. The Rose and Crown Pub offers an authentic taste of British pub culture. Photo by Mark Goldhaber. You can drink all over World Showcase, but you can't step up to an authentic looking British pub and have a beer anyplace else but here at the Rose and Crown. It's a classic looking pub with dark woods and leaded glass everywhere you look. I've happily enjoyed a Guinness or a Boddington's and a Scotch egg at the pub in the past. I haven't been fortunate enough to be there when Carl the bartender is working, but I hear he's a Disney legend in his own right. 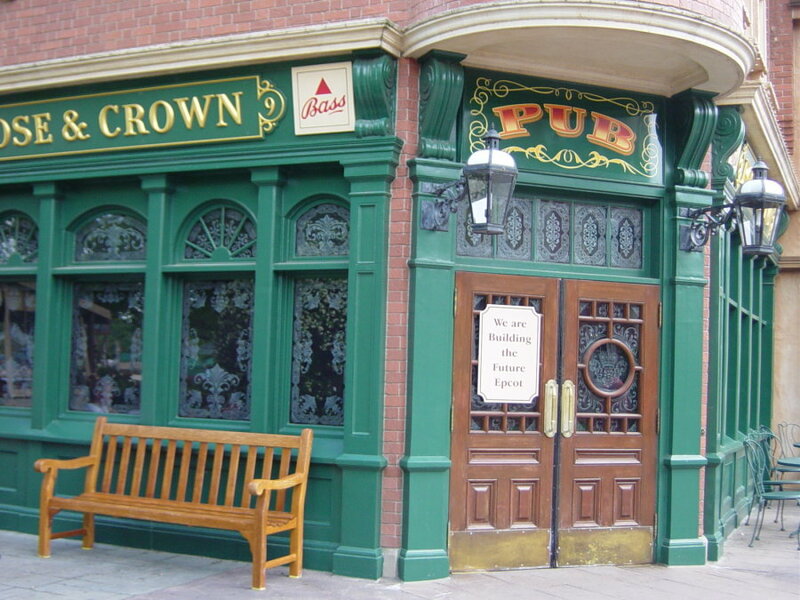 It'd be hard to have a more authentic pub experience anywhere in Walt Disney World and given the significance of pub culture to the United Kingdom, this should be a must stop on your visit to this particular World Showcase country. The UK pavilion is a great place to meet some awesome Disney characters. Alice typically holds court in the gardens next to the thatched cottage. Even if you're not up to waiting in line, it's awfully cool to walk by and spot her greeting little ones. My daughter always loved meeting Alice. She was typically one of the most fun characters to spend time with and always had a lot to say. It doesn't stop with Alice though. The UK is also a place to meet, who else but, the practically perfect Mary Poppins, also a big favorite of my daughter. 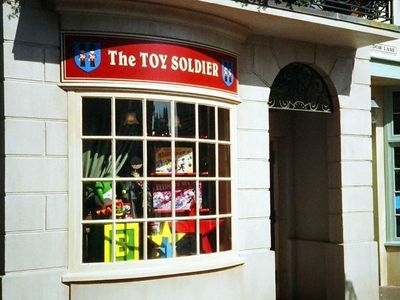 But perhaps the best kept secret is meeting Winnie the Pooh and Tigger way in the rear of the pavilion inside the back of the Toy Soldier Shop. 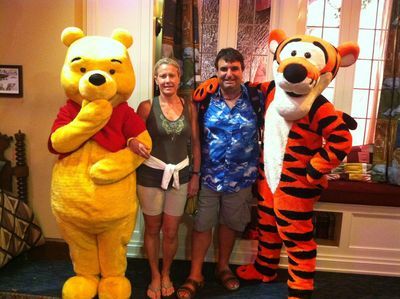 Pooh, Tigger and two of their best friends shown here in the UK pavilion at Epcot. Photo by Samantha Barry. The last time we were wandering around the gardens back there, we poked our heads into the shop and saw Pooh and Tigger waving us in. There wasn't a solitary person on line to meet them! That doesn't seem to happen anywhere with any characters, none the less two "biggies" like Pooh and Tigger. So, give it a shot on your next trip and see if this is a consistent score. I have a feeling it just might be. Not only can you meet Winnie the Pooh in this cozy shop in Epcot, you can find some classic British toys such as Thomas the Train, actual toy soldiers, Paddington toys and, of course, the aforementioned silly old bear. The interesting thing about this shop is, despite the name, they sell a lot more than just toys. This is the place for some British pop culture gifts as well. You can find Beatles, Rolling Stones, and The Who merchandise at the Toy Soldier. I found a great Yellow Submarine ornament there a few years back. They've also recently begun selling Doctor Who merchandise as well. It's a fun place to shop and I just about always walk out of there with something in a bag to bring home. 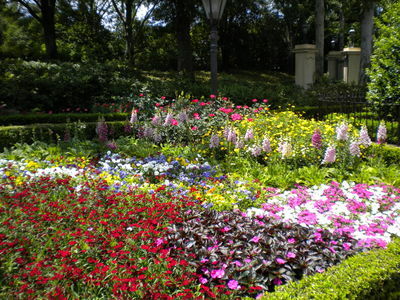 I've mentioned gardens on several of my lists throughout World Showcase, and the UK pavilion's flower beds rank pretty high on the list of beautiful spots in Walt Disney World. Whether it's the miniature hedge maze out by the gazebo or the stunning gardens out on the main promenade by the classic red phone booths, you're never too far away from something beautiful as you walk through the UK. Stop and smell the flowers in the United Kingdom tea garden. Photo by Chris Barry. My favorite spot in the pavilion and one of the most beautiful in all of World Showcase is the tea garden behind the thatched cottage. Cut through the Twinings Tea shop and walk out into the lush English gardens to have your breath taken away. Each of Epcot's 11 pavilions feature authentic representations of their host nation's traditional architecture. The UK pavilion takes that notion to a higher level though, offering a virtual history of British architectural styles all coexisitng in one small village. Here you'll find impressive medieval castles, Victorian and Georgian style buildings, and a thatched cottage that pays tribute to William Shakespeare. It's a hodgepodge of styles and yet they all somehow cohesively exist together here in the UK pavilion. It's one of the most successful features of the pavilion's design. The streets of the United Kingdom showcase a wide array of British architecture. Photo by Alex Stroup. The Imagineers wanted to pay tribute to the vast history of English architecture and yet make you feel like you were in a small village at the same time. It's an extremely impressive feat, and more than likely goes unnoticed by the average guest touring through the pavilion. Don't make that mistake on your next visit. It's a brilliant use of different architectural styles and makes the UK pavilion one of the most detailed and unique spots in Walt Disney World. I get so excited walking from our room at the Yacht Club over to World Showcase. As you approach the International Gateway you might hear the sounds of The Beatles or The Stones as the band British Revolution plays out in the gazebo. As you make that turn into the UK, you catch the delectable scent of the fish and chips emanating from Yorkshire County Fish and Chips on the banks of World Showcase Lagoon. The amazing flower beds catch your eye and invite you to tour the streets and shops of the United Kingdom. As I said before it's typically the first spot we encounter when we arrive in World Showcase and we've developed such an affinity for the place over the years. As it welcomes you in, the UK pavilion exudes the warmth and charm that I've experienced firsthand when I visited England myself and it's become such a true favorite of mine over the years. I can't wait to be back. Maybe this time, I'll keep that reservation at Rose and Crown and have some bangers and mash outside by the lagoon as I kick back with a cold pint and wait for Illuminations to start. That sounds positively delightful doesn't it? 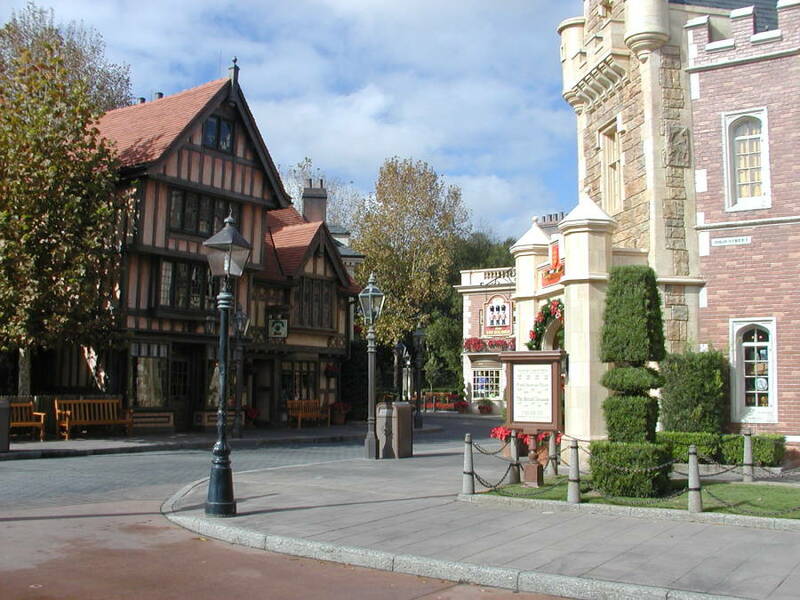 As always, I'd love to read your thoughts on Epcot's UK pavilion. Click on the link below, let me hear what you have to say about my list and I'll see you next time as we finally wrap up our tour of World Showcase in Canada. I have yet to enjoy a dinner at the Rose & Crown. But it's a standard feature of my vacations to have my last lunch out on the patio of the R&C. And of course I've spent many a fine hour bellied up to the bar, where they make a fine martini! U.K. is my favorite place to hang out at World Showcase. I like to sit and listen to whatever band might be playing, just to soak up the ambiance. A meal (usually lunch) at Rose and Crown is a requirement every time I visit WDW. It's one of my favorite restaurants. I enjoy talking to our server (they're usually only there on a 12 or 18 month visa, so we've never gotten the same person twice) about what made them decide to come to the States and what their experience has been like. On our last trip this past early January, we were sitting in the courtyard waiting for the band, and some people came back there looking for the character spot at the back of the store. It was clear there was something that had previously been set up there but nothing was happening, so I don't know if it's still happening or if it just wasn't happening at that time. I love the garden area, and the last couple times we'd been there, it was during the Flower and Garden Festival, so they had all these giant teacup displays, each showcasing a different kind of tea, all throughout the garden. I loved that. I also really liked that they had a Peter Pan topiary high atop one of the buildings. I even looked for him on this last trip before realizing, no, he wouldn't be there now! They had a nice topiary display of Captain Hook and Croc as well. That patio always looks like a great place to sit and dine. Sorry, can't behind the martini!! To each his own. Our good friends consider the fish and chips a necessity on each trip. The characters get breaks, so they must've caught an off time, but Pooh and Tigger are pretty consistent back there. I LOVE the fact that they put the Peter topiary up on the roof!! I think it's the prettiest pavilion to see during Flower and Garden. There was a time when #1 would have been the World Showcase Players. That was the best live show Epcot ever had. 30 minutes of interactive British comedy. It was the BEST!!! On my first trip to Epcot in 2002, I thought the park was just ok. I didn't get it....until I caught their show. It was then I "got it". The whole international appeal thing. They're the ones that come to mind when I think of World Showcase and Epcot. I often blame my lack of return to WDW since 2012 on FP+ or high airfare from Cali. But really, eliminating the WSPs was a big thumbs down for me. I can't imagine going back to WDW without them there.